January 19, 2013 - On Friday the Pentagon and U.S. Navy temporarily grounded the Navy’s most sophisticated jet, the Lockheed Martin F-35B fighter jet after an exhaust system propulsion line failure. On Wednesday during a training flight at Eglin Air Force Base in Florida the Navy’s F-35B fighter jet encountered an exhaust system propulsion line failure prior to takeoff. The pilot aborted the takeoff without incident. Joe DellaVedova, spokesman for the Pentagon's F-35 program office said "Implementing a precautionary suspension of flight operations is a prudent response until F-35B engineering, technical and system safety teams fully understand the cause of the failure. Safety of pilots and ground crew is the top priority of the program." The Lockheed Martin F-35 Lightning II is a family of single-seat, single-engine, fifth generation multirole fighters under development to perform ground attack, reconnaissance, and air defense missions with stealth capability. The F-35 has three main models; the F-35A (Air Force) is a conventional takeoff and landing variant, the F-35B (Navy) is a short take off and vertical-landing (STOVL) variant, and the F-35C (Navy) which is a carrier-based variant. 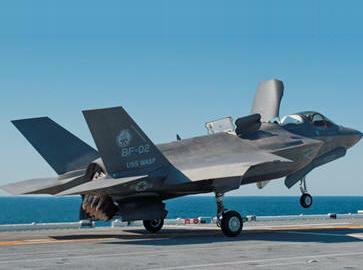 The Pentagon said the grounding only affected the F-35B model fighter jets. The F-35B is powered by a Pratt & Whitney single-engine F135 jet engine. Pratt & Whitney’s spokesman Matthew Bates said that initial inspection discovered a detached propulsion line in the rear part of the engine compartment. Bates said "A team of Pratt & Whitney and Rolls-Royce engineers is investigating the cause of the incident and working closely with Lockheed Martin and the F-35 Joint Program Office to resolve the matter". Last week the Pentagon sent an 18 page report on its F-35 program to Congress. The reported indicated that the F-35 flight tests were ahead of schedule however, lagged in some areas due to unresolved problems and newly discovered issues. The Pentagon’s report details an array of problems which underscored the “lack of maturity” of the $396 billion fighter program. The report indicated that about 34 percent of the test program has been completed.